Meditation practice fosters an inner courage that brings clarity and strength to both our understanding of ourselves and our intimacy in relationships. There are four kinds of courage that can be discovered and cultivated through practice, and this daylong retreat will explore each of them, as well as provide a framework for continuing to engage with courage in your life off the meditation seat. Visiting Teacher Dhammadipa will give teachings on these four: the courage to be upright, the courage to be kind, the courage to rest in emptiness, the courage to be liberated. Join us for a day of sitting, walking meditation, two Dharma talks, and a community meal. Dhammadipa, also known as Konin, is a resident nun at Aloka Vihara Forest Monastery. She went forth as a samaneri after 31 years of Buddhist practice. 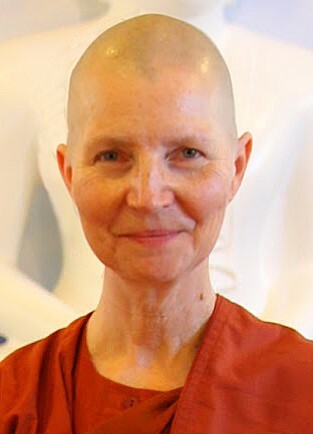 She has received Dharma Transmission in the Shunryu Suzuki lineage of Soto Zen Buddhism, after having been ordained a Zen nun in 2007 by Sekkei Harada Roshi. Dhammadipa teaches the Dharma in English and in Spanish, an expression of her American and Latin heritage. She is trained as an inter-faith chaplain, and has provided spiritual care in both hospital and hospice settings. Dhammadipa earned an MBA and worked in finance for many years before becoming a full-time practitioner. She greatly enjoys her relationship with her adult daughter, and sewing. Dhammadipa's teaching website can be found at www.Dhamma-dipa.com. We will begin Friday with an orientation to practice. If you are new to meditation practice and find the sitting periods too difficult, you are welcome to quietly take a break. Scheduled breaks are short due to the limited space; if you need extra time please take it when you need it. Vegetarian lunch will be provided with any grains or dairy on the side.